San Francisco bay area is a good place to live in: good sunshine, pleasant hills, summer beaches, good driving, old free books, good wines and good weekend parties with good people. Tibetan community there is very vibrant and active. Most of the people are very community-driven and with great Lhaksam. Tibetan Association of Northern California (TANC) is one of the most active associations in the West. But the paradox of the fact is that while Tibetan population is strong and growing, the Tibetan language is dying. 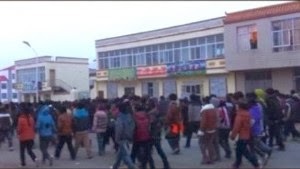 Our people are passing through a crucial time there, and I want to share what I have observed about the Tibetan language, its situation and how despite the people, the language is dying. Most importantly how and what needs to be done to make it a living language in the West. My long but short sojourn in California coincided with the time when the economy in the States was on a long diet; no wonder the jobs were not readily available. I took to freelance translation, the first job that I got was one proof reading from a European country; it was a marriage certificate issued to a Tibetan couple by a certain Tibetan Association in Nepal. It was translated very well in terms of meaning, but from the way it was translated, I could see that the translator is a foreigner. That was my first earning in the United States. I felt like I earned a million dollar, it was a real homecoming feeling! I realized the importance of Tibetan language. As a Tibetan, I got this work of proof reading. And the translator, who is a foreigner, got this assignment because he/she has studied the Tibetan language. Had this marriage certificate been not issued in the Tibetan language in the first place, the foreign translator could not have acquired this assignment and I, the proof reader, could not have earned this work. It is the economic dynamics of the Tibetan language. We all talk about the preservation of Tibetan language and culture. If Tibetan language is to live and survive, it has to live and play active role in the socio-economic lives of all Tibetan speaking people in and outside Tibet. In the translation world, Tibetan translation assignments come from the U.S. Canada, India, European countries etc. All these work of Tibetan translations and proof readings are possible because the principle client involved has or wants a document in Tibetan language. But the volume of Tibetan translation work is not enough to provide any translators a decent earning to live. So, the profession is dying, some does it as a part time or as a hobby. We need to create enough demand (Tibetan language) to increase the supply (use) of the language. It is in consonance with the economic law of demand and supply. In the course of my job hunting, I finally made into the Employment and Human Service Department of Contra Costa County of California, where I worked for sometimes. It was a great experience. The United States is a great country, it respect and accommodate all the languages used by the immigrants: Spanish, Chinese, Japanese, Korean, Hindi, Nepali etc. even the regional languages like Tamil, Panjabi, Hmong etc. All these languages are in the list of languages endorsed by the States for communication and translation provision. But the Tibetan language is not there. I asked my supervisors and colleagues why Tibetan language is not there, and fervently informed that the Tibetan language is one of the major languages in Asia, and that there are more than 12 million people using this language and that there are substantial number of Tibetans in California alone. I was informed that this is a computer's decision. They said, "If the Tibetan language is not there, your people may not have asked for it!!" Whenever the immigrants or the citizens correspond with or seek social benefits from the counties, there is a form "Gen 22" which is mandatory to fill. This form asks the client if he/she is comfortable with English language or not? Whether the clients prefer any other language of communication? The reason why the Tibetan language is not appearing as one the immigrants' languages is that most of the Tibetans have ticked "comfortable with English", and have not requested communication in Tibetan language. This information is fed into the computer. So, the robotic machine has no means to report the need of the Tibetan language to the County. If Tibetan people want the Tibetan language to live as one of the immigrants' languages, they should use the language and fill the form accordingly. This, I think is same with other countries too, especially Canada and Australia. Chinese government is bent on destroying our language and replacing it with the Chinese. We condemn and fiercely protest against Chinese government for destroying Tibetan language in Tibet, but what are we doing in free countries to preserve and maintain it? Tibetan people are generally very patriotic, culturally strong and they frequently talks about the importance of Tibetan language. Tibetans in foreign countries do their best to send their children to community Sunday school where the language is taught. But the irony is that while they insist their children to learn the native language, they themselves are not that fervent. Therefore, the children are confused as to why they need to learn the language which has no relevancy with the environment around, and for which there is no incentive also. This fact is evident from an incident during the visit of Ven Lhakdor la, Director of Library of Tibetan Work & Archive, to the Tibetan Sunday School in San Francisco. During the question and answer session, a young girl asked, "Why do we need to learn the Tibetan language?" This question from a young girl, although a simple innocent question, it reveals the grave situation the Tibetan language is in the West. If we really want to preserve and let the Tibetan language live in the West, we should practice and respect the language ourselves first. If we don't want it, nobody will want it. We need to strive to have the Tibetan language get its rightful place among other languages. One important way of gaining recognition for the language is to achieve University accreditation so that our children or anyone studying the language could earn credit in the High school or in the college. San Francisco Tibetan Sunday School is already working on this. This will let the language live in academic curriculum and give the students incentive to learn the language. If the Tibetan speaking people all round the world want to stop the language from dying, we all need to let the language have its social, economic and literary utility and relevancy in our daily lives. Two things that must be initiated are: to have the Tibetan language among other immigrant languages in the region by filling the form accordingly, secondly to have the language achieve and get recognized in the academic worlds. This will greatly boost demand for the Tibetan language. It is only the Tibetan people who can propel this law of demand and supply of the Tibetan language. No matter how brutal and insidious the Chinese government's policy, it can never eliminate the Tibetan language. If there is anyone who can do this, it is the Tibetans. Finally, I would like to share this stanza of Gedhun Chophel, one of the Tibet's greatest scholars. NOTE-- Tsewang Gyalpo Arya is the secretary, Bureau of His Holiness the Dalai Lama in New Delhi. The above article is republished from phayul with permission from the writer.